Can you eat 12,000 calories in under an hour? If you can finish the “Kookamonga” Burger in 60 minutes, without aid from others, you get the burger for free! You also get your picture on the Hall of Fame! At Kooky Canucks the Kookamonga Burger is 4lbs of fresh ground-chuck, two pounds of our custom made hamburger bun, and one and a half pounds of lettuce, tomatoes, pickles, onions, and cheese…SEVEN AND A HALF POUNDS TOTAL…but the fries are optional. To burn off the calories in one Kookamonga burger you would have to do high impact aerobic exercise for 25 hours or ride a stationary bike for 17 hours. 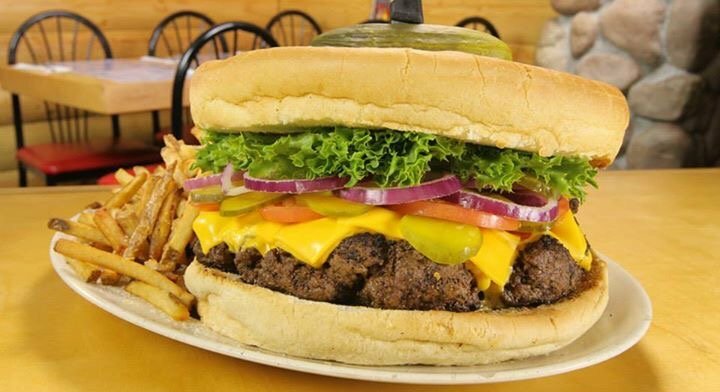 Our Kookamonga Burger is 4lbs of fresh ground-chuck, two pounds of our custom made hamburger bun, and one and a half pounds of lettuce, tomatoes, pickles, onions, and cheese…SEVEN AND A HALF POUNDS TOTAL…but the fries are optional. We use 80/20 ground chuck then we cook and season it exactly the same way we do our regular burgers… it just takes a whole lot longer – about 40 minutes longer in fact. Adam Richman hosts a popular show on the Travel Channel called Man V. Food. Kooky Canuck, previously known in 2008 as The Big Foot Lodge, was featured in Season 1 Episode 2 where Adam attempts, and fails to complete the Kookamonga Challenge (formerly known as the Big Foot Challenge), which includes eating a 10 pound burger in under 1 hour!